Yesterday, the House of Representatives Standing Committee on Infrastructure, Transport and Cities handed down the report from its ‘Inquiry into the Australian Government’s role in the development of cities’, titled Building Up & Moving Out. We Ride Australia appeared before the Committee, as did many peak bodies, experts and advocacy groups, in support of submissions made to the inquiry. Across twelve chapters, the report focuses on a wide range of topics from national settlement plan and urban planning, guidelines and transport systems to smart cities and infrastructure procurement, housing affordability and role of the Commonwealth. Urban connectivity is one of the twelve major themes in the report and is where walking and cycling is referenced. The Committee recommendations are clearly in favour of investment in walking and cycling – stating that governments, as part of ensuring transformation to a more sustainable urban form occurs, must ‘actively plan for and promote the integration of active transport within the transport network’. Rec.#11 (of 37). Interestingly, it recommends ‘re-endorsing the Urban Design Protocol for Australian Cities’ first developed by Labor Minister Albanese’s Major Cities Unit (#24) and appoint ‘a Minister for Cities and National Settlement’ (#28). Unsurprisingly, a number of organisations contributed statements outlining the problems for active travel and in favour of greater investment. They included the Heart Foundation, Prof Matt Burke, the Green Building Council of Australia and the Committee for Sydney. #6.52 ‘The importance of incorporating active travel into urban design was highlighted by Mr Stephen Hodge, Government Relations Manager for the Australian Cycling Promotion Foundation, who observed that more people would cycle for transport ‘if the conditions were safer’. The positive provision of bicycle infrastructure (ensuring it is considered as part of any investment in major transport projects) is a long-held policy priority for We Ride Australia and it was very interesting to see a call for the positive provision of bicycle and pedestrian infrastructure made by Roads Australia. #6.62 Roads Australia argued that ‘for all new city infrastructure and property developments, upgrades and renewals, bicycle and pedestrian infrastructure should be mandatory component of the planning approval process and be represented completely in project scope where practicable’. No recommendation to adopt positive provision has been included in the Committees recommendations however. There are many comments made by witnesses in the Committee hearings published in the report and those relevant to cycling are contained in the section on ‘Active Transport’ in Chapter 6. Urban Connectivity. #6.112 It is also important to incorporate active travel into location and transport network design. The social and health benefits of walking and cycling were identified by a range of stakeholders. Walking and cycling have natural synergies with public transport, and these should be exploited to their fullest in the design of public transport networks and related spaces. Once again, integration of different transport modes is seen as the key to success. It was emphasised, however, that the uptake of active transport was dependent on the creation of safe and appropriate spaces. Pedestrian and cycle access within and between precincts needs to be part of the original design, not an afterthought, and safety has to be a paramount consideration. Cycling, in particular, has to cater for a range of user levels. While road access is often essential for commuter cycling, recreational cycling by younger and older age groups is best served by separation from motor traffic. Cycling is best facilitated by high levels of both on- and off-road access. Although recognising that ‘the uptake of active transport was dependent on the creation of safe and appropriate spaces‘, sadly the preceding statement ‘While road access is often essential for commuter cycling, recreational cycling by younger and older age groups is best served by separation from motor traffic‘ also re-states the public’s prevailing view of commuter cycling as roads-focused, instead of recognising the need for cycling by all ages and abilities (8 to 80) to have separation from traffic. While We Ride Australia is concerned particularly with the positioning of bicycling as a key aspect of sustainable transport in cities and increased liveability for all, the report’s primary objective is to investigate the role of the Commonwealth in the development of cities. The three final sections cover their conclusions in the chapters on the role of the Commonwealth in policy, planning and leadership (Ch.11), in governance, funding and taxation (Ch.12) and infrastructure procurement (Ch.13). If all recommendations made by the Committee were adopted by the Government, we believe it would have a major positive impact on the Commonwealth’s engagement in cities. The Committee has a membership of ten MPs evenly distributed between parties. Submissions to the Inquiry were followed by invitations to present in person before the Committee in a number of Hearings held around the country. They are a chance for the Committee to ask questions of the witnesses based on their submissions and can be very animated, lively sessions. The ‘witness statements’ are treated as legal statements and are recorded as such on Hansard – the official record of the Parliament. The Committee then considers both the submissions and witness statements from the hearings and drafts what is usually a consensus report from all Committee members. When complete, it is tabled in Parliament. Each report is considered by the Government who develop and table an official response in due course. We will track any responses and cover the adoption or otherwise of any of the recommendations contained in the report. While reports allow the Committee to explore the subject in significant depth, Committee members do not hold Ministerial portfolio responsibilities, so they can only make suggestions to the Government of the day. What the inquiries do allow is for stakeholders – like We Ride Australia – to place policy suggestions and evidence on the record and educate and inform Members of Parliament about solutions and options and build support in the House for policy proposals. 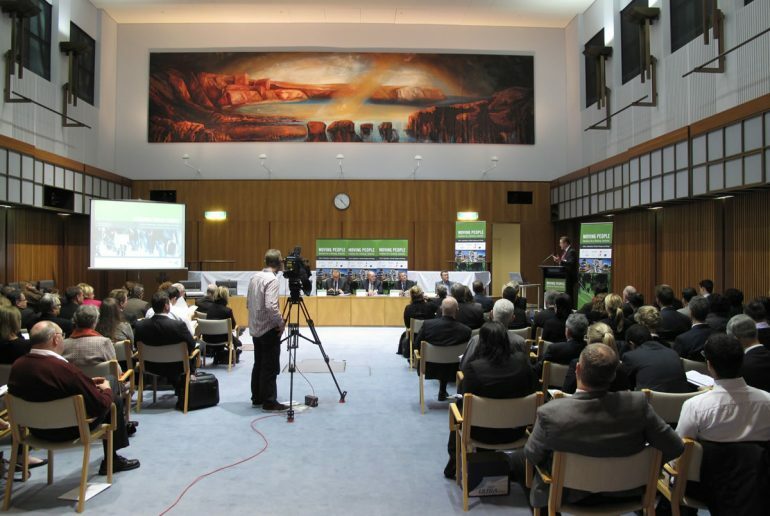 Photo above: Parliamentary event ‘Emerging Crises Summit’, co-hosted by We Ride Australia, held on cities’ issues in 2011.